One of (if not THE) best intake manifolds on the Supra market today! Also available in 12 and 18 injector configurations. Please contact us if you need one of these multiple-fuel-rail setups. We also offer any parts you need separately as well. If you need only the throttle body, rail, etc. please contact us for current pricing and availability. 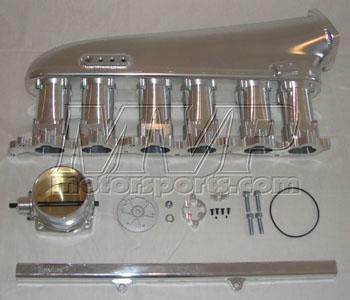 Please note the Street Port manifold comes with polished runners and the Race (Big) port manifold comes with red runners.